Having ongoing knee pain is extremely draining! The frustration builds as treatments fail and exercises cause more pain. We understand this and look to find the underlying cause of the pain and help you find a solution that will last! Have you already tried multiple practitioners for your knee pain? Are the exercises and recommended treatments only providing temporary relief? Or even worse making your pain worse? If this is you, then this article is going to be extremely helpful! There may actually be an answeår that you had no idea even existed! If you have knee pain and want to get rid of it (or at least minimise it to the max), then the next few nuggets of truth are going to be extremely valuable to you! Getting a injection may on the surface seem like a great idea! It will take away the pain – but does that simply leave you free to destroy the joint and cartilage while the injection is still working? Studies would suggest that the answer is yes. Short term minor gain, long term major LOSS. 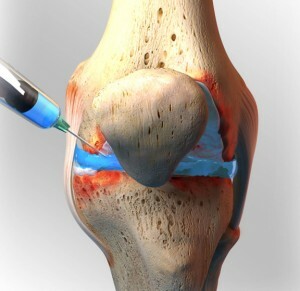 The chemical compound that makes up your cortisone shot actually degenerates your injury faster – yes, you read that right – you are injecting something directly into the joint that we know makes it worse! So if you are planning on using cortisone to dampen the pain – think again. Because it makes it worse, not better. 90% of the time weak knee muscles are not your priority problem. When you develop muscle weakness, it’s for a reason. There is almost always underlying issues that can be easily identified by an expert with special training in helping patients with knee pain. The truth here is that telling your patients that they have weak muscles is the easiest way to palm off all responsibility to the patient for fixing their own problem. Having a cookie cutter approach of “knee pain exercises” is so non-specific that your results are going to come down to random chance. There is a principle that work here: Trying to apply a simplistic solution to a complex problem doesn’t work. 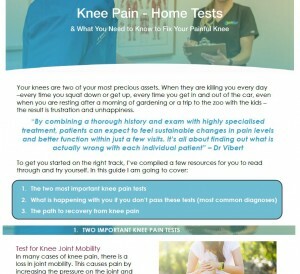 Download my free guide on knee pain. It includes tests for your knee that you can do at home, some of the most common diagnoses that are often overlooked and my tried and tested Roadmap to overcoming chronic knee pain! Knee mobility or flexibility is a very big deal indeed! Simply put – your knee requires full, pain free range of motion to be healthy. Full stop. If it can’t flex and extend the whole way the joint is constantly getting damaged. It leads to chronic pain and continuous degrading of the cartilage. This one fact on its own is completely overlooked by almost all musculoskeletal practitioners! Can you believe it?